Create a simple tabular report to list open suggestions. Create a summary report with a report chart. Create a simple dashboard based on the summary report. 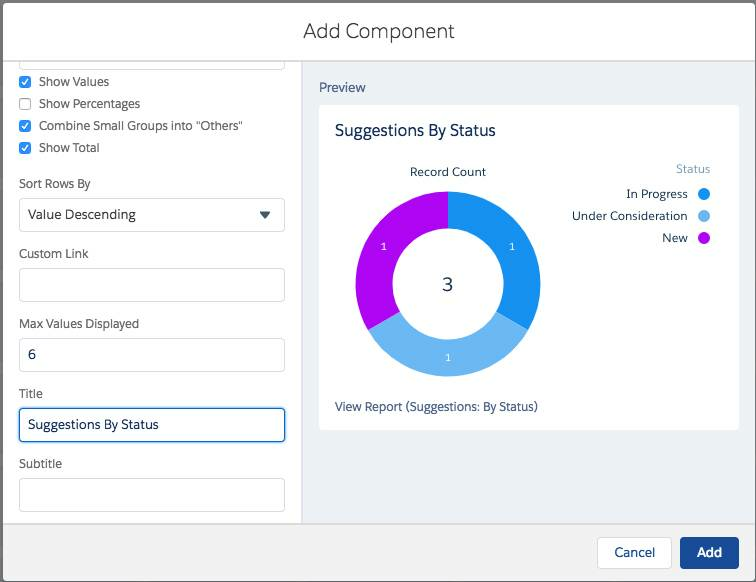 Try the reports and dashboards in the Salesforce mobile app. 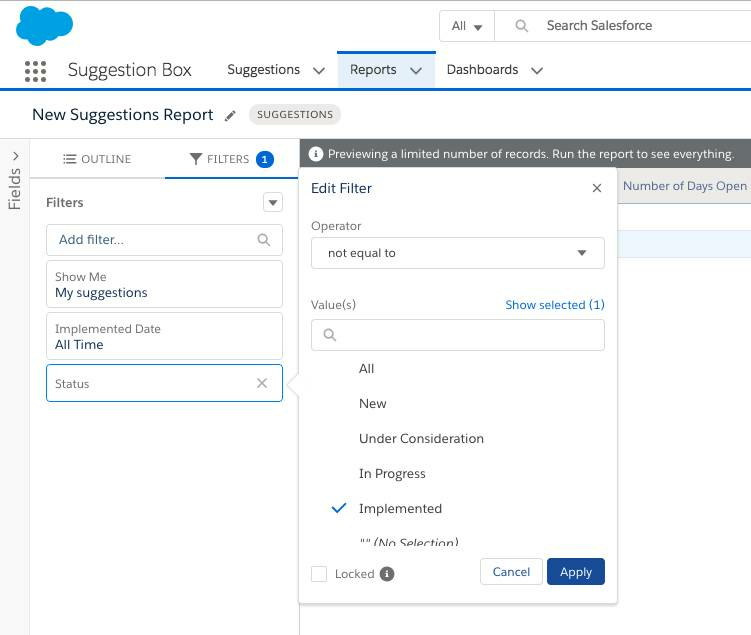 The Suggestion Box app you created includes a Reports tab and a Dashboards tab, where you can create, edit, and run reports and dashboards. These features make an app more useful by providing the business with valuable insights. Let’s start with a simple tabular report to show the number of suggestions received and the status of each one. A tabular report presents data in simple rows and columns, much like a spreadsheet. You can use it to show column summaries, like sum, average, maximum, and minimum. Click the and select Suggestion Box app. Select the Reports tab, click New Report. In the Search Report Types, enter Suggestions and choose Suggestions. If you don't see the Suggestions report type, go back to Setup and click Object Manager. Next to Suggestion, click Edit. Under Optional Features, check Allow Reports. Click Save. Then go back and create the report. In the Report Builder, notice that the Suggestion Name field is already on the report. In the preview screen, you can see the sample Suggestion records you created in previous steps. Enter Status in the Add Columns search and select Status. Similarly, enter Number of Days Open in the Columns search and select Number of Days Open. Note: You can also drag the fields from the Fields pane in the left into the Columns section. To make sure that you’re viewing only suggestions that still need to be implemented, select Filters. Enter Status in Add filter search and select Status. In the Edit Filter of Status, change operator to not equal to and change Value(s) to Implemented. Click Apply. Click Save, and name your report Suggestions: Status of Open Suggestions. Click Save and then Run. It’s often a good idea to give users a visual way to understand the data in your report. Tabular reports don’t include charts, so let’s copy the report and make a Summary report. Then, you can add a chart. 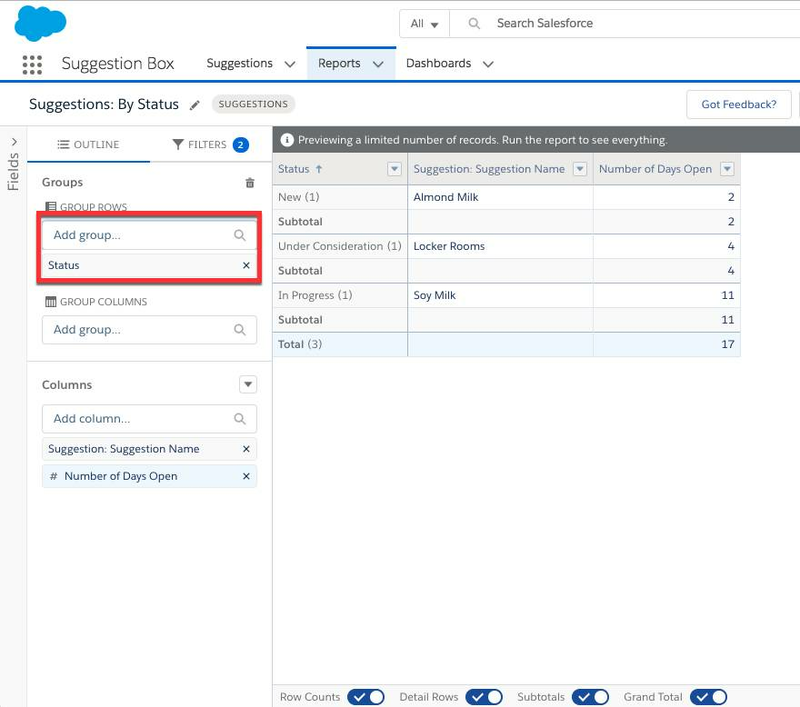 From the Report Results view of the Suggestions: Status of Open Suggestions report, click the dropdown on the right of Edit and choose Save As. Type Suggestions: By Status as the report name. In the Groups search, enter Status and select Status. Click Save and then Run which leads to the Report Results view, click the Add Chart button to Add chart to this report. Click on the gear icon and choose Donut chart. In the Chart Title type Suggestions Status and in Value dropdown, choose Record Count. Click the dropdown next to Edit button and then click Save. 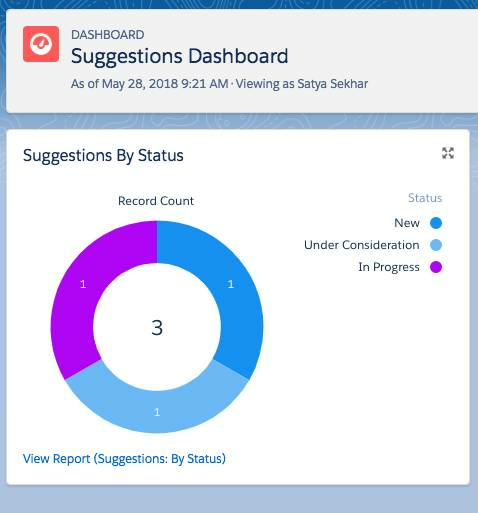 The doughnut chart displays above the report results and shows the total number of open suggestions by status. Dashboards in Salesforce are like a dashboard in your car, showing you important information at a glance. Dashboards can show data in charts, gauges, tables, and metrics. Dashboards are powered by reports. Go to the Dashboard tab and click New Dashboard. Type the Dashboard Name as Suggestions Dashboard and create it on the default Private Dashboards folder. Click the +Component button at the top right to add a component. In the Report Search, look for Suggestions: By Status and select it. Click Select. 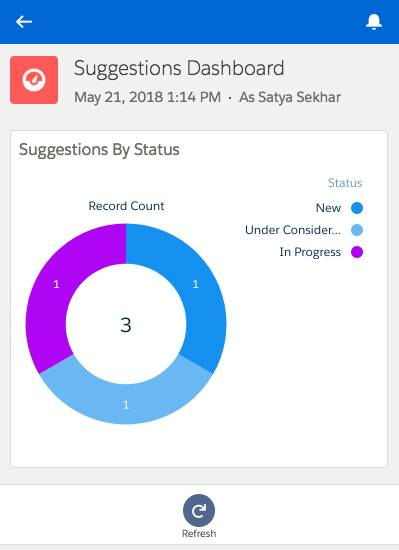 Choose the donut chart and select Record Count in the Value dropdown. Scroll down to edit the Title as Suggestions By Status. You are now a mobile app developer! This is a simple but complete app, and from here you can continue to add functionality or build another app with these skills. Let's see how these reports and dashboards look in the Salesforce mobile app. Scroll down and click Reports in the Apps section to display the reports that you recently viewed. Click either of the reports that you created. Sort the columns, and click a row in the report to test its functionality. Now let’s try the dashboard. Click the icon to open the left navigation bar. Click Dashboards to display the dashboards that you recently viewed. You did it! You built a simple suggestions management app, all without a single line of code! You started by creating the simple data model and the default user interface for managing suggestions. You then customized the user experience on the browser and mobile app by using drag-and-drop editors. Next, you added business logic with the formula language and process builder. Finally, you created some reports and dashboards so that you could monitor and analyze your business data. You can continue your journey and dive deeper by following the links in the Resources sections of this project.